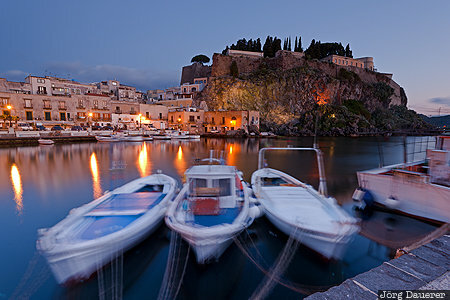 Moving boats in the harbour of Lipari and the flood-lit city with its castle (Castello di Lipari) in the background seen at the blue hour before sunrise. Lipari part of the volcanic archipelago of the Aeolian Islands north of Sicily, Italy. This photo was taken in the morning of a sunny day in March of 2017. This photo was taken with a digital camera.